St Vincent and the Grenadines was proudly represented at the second Annual International Day of Friendship Unity Parade on Sunday, August 2. The International Day of Friendship, which includes nationalities around the world, is an initiative of the Brooklyn Borough president Eric L Adams, who started the event in an effort to celebrate the cultural and ethnic diversity of Brooklyn. This celebration is done through the three activities that constitute the Unity Parade, namely: the parade of flags through the streets of downtown Brooklyn, a cultural showcase of cultural items from various countries and a continental cuisine showcase where participants can taste a variety of national dishes. Addressing the large gathering of participants and guests at the Brooklyn Bridge Park where the cultural event took place, Borough president Eric L Adams noted that there are over one million foreign nationals living in the Borough of Brooklyn, making it the most diverse place in all of the United States of America. He further stated that the goal of the International Day of Friendship is to celebrate Brooklynâs diversity by bringing together the various nationalities in a show of brotherhood, solidarity and unity. Over 120 countries were represented at Sundayâs event and St Vincent and the Grenadines is proud to have been invited to participate in such a noble activity and has pledged its continued support for the work geared towards achieving global peace through Friendship. 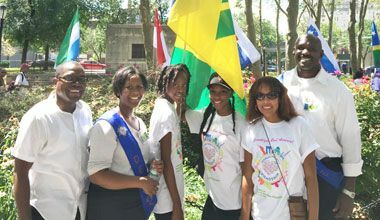 The St Vincent and the Grenadines delegation to the International Day of friendship Unity Parade also included Janelle Humphrey, Alexi Humphrey, Kaiia Phillips, Alecia Williams, who carried the flag in the parade, and Terrance Edwards, who staked the national symbol at the flag staking ceremony.